The current phase of time in the field of radiation therapy is revolutionary period technology wise when day to day new and better radiotherapy machines equipped with different modes of treatment are being introduced, for example, intensity-modulated radiation therapy (IMRT), image-guided radiation therapy, arc therapy, and in recent days, flattening filter-free IMRT. The developments in all these techniques are of special concern with the patient setup accuracy, treatment time, and the dose conformity to the target with precisely saving the organs at risk using multileaf collimators. The treatment planning systems (TPS) are also being developed and upgraded in parallel with these plan-delivering machines. The newly introduced TPS are technically more efficient, fast, and have more accurate dose-calculating algorithm which enable the users to do planning in short time with enhanced accuracy. Along with accurate dose calculation and good treatment planning, it is also very important to verify this planned dose by delivering the plan on linear accelerator (LA) and measuring the dose using small volume ion chamber and quality assurance (QA) phantom. Use of different QA phantoms of homogeneous density equivalent to that of water, i.e., 1 g/cc is done widely following the AAPM TG Report 120. However, doing the patient-specific QA using a homogeneous phantom is not justified as the dose deposition pattern in highly inhomogeneous medium (human body) is totally different from that in a medium having uniform density throughout its volume. The dose deposition is affected by the density variation in the medium specially at the interface of two densities, for example, bone-soft tissue interface and cavity-soft tissue interface. Hence calculating dose on CT images of a homogeneous QA phantom and measuring it on LA using the mentioned phantom gives very less error, mostly not more than 1%-2%. However, calculating the dose on CT images of a heterogeneous QA phantom and then measuring on LA using the same phantom will yield comparatively higher error, which indicates that the algorithm in the TPS is not accurate enough. Few QA phantoms with the heterogeneous density (anthropomorphic phantom) are commercially available in the field of radiotherapy. However, these phantoms are very costly and most of the radiotherapy centers in developing countries cannot afford to purchase these phantoms due to the cost factor. Therefore, this study has been carried out to fabricate the heterogeneous density QA phantom for the dose verification in the case of chest site radiotherapy plans. Slab-pinewood-slab (SPS) phantom of the dimension 30×30×29 cm 3 was made using the 15 slabs (each of 1 cm thickness) of “solid phantom SP34 (SP34 phantom)” (IBA Dosimetry GmbH, Schwarzenbruck, Germany) and seven slabs (each of 2 cm thickness) of pinewood. A hole of the chamber size was made in one wood slab for inserting the chamber inside for measurements. The phantom comprised five SP34 slabs at the top, and then seven slabs of pine wood in between and then again ten SP34 slabs at the bottom. Each slab of SP34 phantom is made up of polystyrene C8H8 (composition: 98% polystyrene + 2% TiO2) with effective atomic number 5.74. The wood slabs were specially designed by cutting the dry light pine wood using the commercial wood cutter machines at wood shop. The density of SP34 phantom slabs is 1.045 g/cc which is equivalent to that of muscle and fat. The SPS phantom is shown in [Figure 1]. The present study has been done in two parts, first one is the dosimetric study on TPS and the second one is the verification of planned dose on TPS on the CT images of SPS phantom and SP34 phantom by measuring the dose on LA Varian Clinac DMX (Varian Medical Systems, Palo Alto, CA, USA) using SPS and SP34 phantoms. In the first part of the study, CT images of three mediums, namely, thoracic region of actual patient, SPS phantom, and the SP34 phantom as shown in [Figure 2] were used. The CT images of thoracic region of the patient already planned were used. The SPS and SP34 phantoms were scanned on a Siemens SOMATOM Definition AS scanner (Siemens Medical Systems, Germany) and CT images of 3 mm slice thickness were acquired for the planning purpose. In the case of SPS phantom, CT imaging repeated thrice to obtain three sets of CT images by placing the chamber holding slab of pinewood at three different positions, namely, just below the five SP34, at third position among pine wood slabs, and just above the ten SP34 slabs as shown in [Figure 3]. The chamber used was a 0.13 cc ionization chamber (IBA Dosimetry, Germany) which is available at our center along with DOSE1 electrometer (IBA Dosimetry, Germany) for dose measurement. All CT image sets were imported on TPS Eclipse version 8.9 (Varian Medical Systems, Palo Alto, CA, USA). The SP34 slabs were delineated as tissue-equivalent medium and pinewood slabs as lung-equivalent medium. Ion chamber was also delineated to specify the dose at its active volume. A single beam of 6 MV x-rays of 10 cm×10 cm field size was directed on to the chest wall, SPS phantom, and SP34 phantom perpendicular to the surface with source-to-surface distance of 100 cm. The dose was calculated using AAA version 8.9.08 with a grid size of 0.25 cm. The density of pinewood, SP34 phantom, chest wall, lung, and soft tissue behind the lung was measured with the help of Hounsfield unit (HU) measured from CT images on TPS by HU tool, and the HU-density conversion formula . In addition, the physical density of pinewood was measured by weighing one slab of dimension of 30×30×2 cm 3. The isodose curves of 100%, 90%, 80%, 70%, 60%, 50%, and 40% were measured in all the three CT image data sets and compared. Furthermore, the point doses at the depth of 6 cm, 10 cm, and 18 cm in the CT images of SPS phantom were noted from the TPS. 6 and 18 cm were chosen as each pinewood slab is 2 cm thick, and cavity prepared in one slab for the insertion of chamber is at the center of a slab, therefore placing this wood slab just below the first five SP34 slabs would bring the ion chamber at 6 cm depth from the surface of SPS phantom; similarly on placing this wood slab having ion chamber just above the last ten SP34 slabs would bring the chamber at 18 cm from the surface of SPS phantom. The SPS phantom along with ion chamber was set on LA couch and a cone-beam CT was acquired with the Varian On-Board-Imaging system consisting of a 125 kVp X-ray tube isocentrically mounted to the gantry of the accelerator. Setup accuracy of SPS phantom and the ion chamber inside it was verified by standard procedure using the anatomy-matching software (Varian portal Vision 7.5). After verifying the setup, doses at all the three points were measured and compared with the planned doses at the concerned points. The density of pinewood, SP34 slabs, chest wall, lung, and soft tissue behind the lung was measured as 0.329 ± 0.08, 0.999 ± 0.02, 0.898 ± 0.02, 0.291 ± 0.12, and 1.002 ± 0.03 g/cc, respectively. The HU and density for all the five mediums are shown in [Table 1]. The physical density of pinewood measured by weighing one slab was found to be 0.304 g/cc. 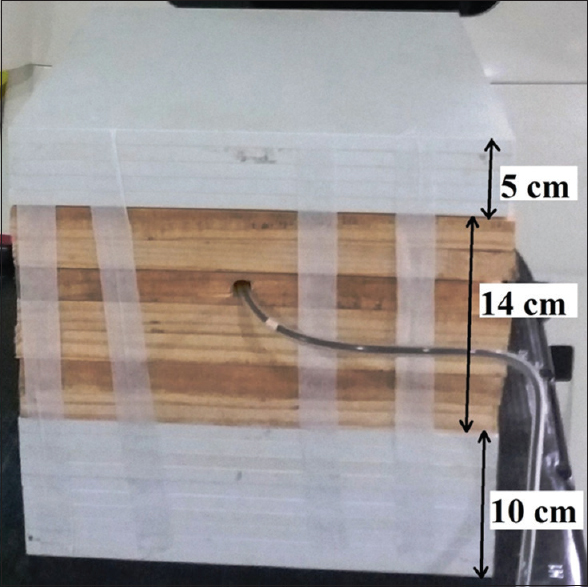 The total weight of 30×30×2 cm 3 pinewood slab was measured as 547 g.
The depths of 100% and 90% isodose curves in SPS phantom, SP34 phantom, and actual patient chest level were found to be similar. The depths of 80%, 70%, 60%, and 50% isodose curves in SPS phantom are little lesser as compared to that in actual patient chest level, while it is least in CT images of SP34 phantom. The depth of 40% isodose curve is highest in SPS phantom than little lesser in actual patient chest level and least in SP34 phantom. The detailed results of the measurements of isodose depths are shown in [Table 2]. The variations in the doses calculated on TPS at 6 cm, 10 cm, and 18 cm depths and measured on LA in the SPS phantom were found to be 0.36%, 1.65%, and 2.23%, respectively. Similarly, the variations in the case of SP34 slab phantom were found to be 0.24%, 0.90%, and 0.93%. The detailed results are shown in [Table 3]. The recent developments in the dose-calculating algorithms have improved the accuracy in dose calculation, however doing the patient-specific QA is mandatory to make sure that the planned dose and the delivered dose in the same medium are within the tolerance limit, i.e., <3% as mentioned in the International Commission on Radiation Units and Measurements 83 (ICRU 83). The ICRU 83 published in 2010 propounds that the biggest causes of treatment failures are geographical miss due to inaccurate target delineation and dosimetric variation more than 3%. Therefore, along with the developments in dose-calculating algorithms, it is also equally important to use the QA phantoms which should have heterogeneity pattern inside same as in human body and the phantom should mimic the actual human body. Since calculating the dose accurately in a simple and homogeneous medium is easy for algorithm, it becomes tedious in a complex heterogeneous density medium. This study has been carried out to study the density pattern and dose distribution pattern in the chest-level CT images having chest wall, lung, and soft tissue behind the lung. These patterns were compared with that on the CT images of SPS and SP34 slab phantoms. 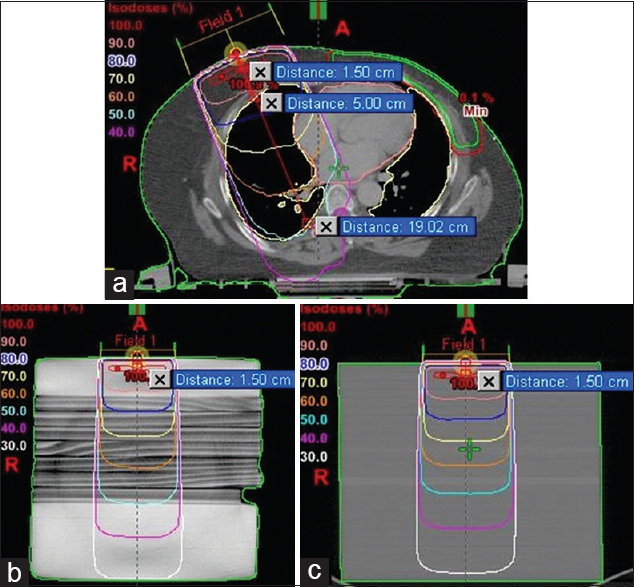 The CT image of the chest wall at beam isocenter had chest wall of 5 cm, lung of 14 cm, and the soft tissue behind the lung of 10 depths at the beam center. The SPS phantom had 5 cm SP34 slabs (five slabs each of 1 cm thickness), 14 cm pinewood slabs (seven slabs each of 2 cm thickness), and 10 cm of SP34 slabs. The measured density of chest wall (0.898 ± 0.02 g/cc) and soft tissue behind the lung (1.002 ± 0.03 g/cc) is near to that of SP34 slabs (0.999 ± 0.02 g/cc), also the density of lung (0.291 ± 0.12 g/cc) is approximately equivalent to that of pinewood slabs (0.329 ± 0.08 g/cc). Therefore, using SPS phantom for the QA of plans done for chest site of the patients is rational. The density of chest wall and tissue behind the lung concurred with the density of soft tissues as mentioned in the literature., The physical density of the lung mentioned in the literature varies between 0.2 and 0.5 g/cc during the respiration, therefore density measured in this study is correct. The measured density of the SP34 slab phantom concurred with the value mentioned in the literature. The radiological properties of the kailwood is equivalent to that of lung medium, also the electron densities in both the mediums are equivalent. However, due to unavailability of the kailwood, pinewood has been used in this study as it is also having low density equivalent to that of lung. The isodose depths on the CT images of all the three mediums, namely, chest level of the patient, SPS phantom, and SP34 phantom are approximately same for 100% and 90% isodose curves. 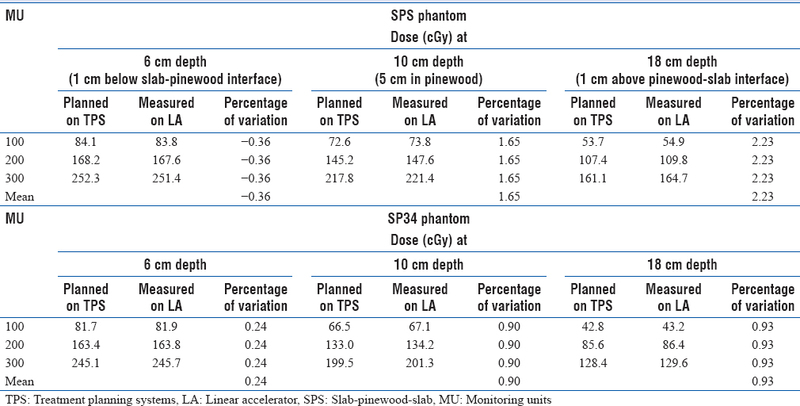 However, 90% isodose depth in chest is higher than that in both the phantoms as its density is slightly lesser than that of slab, also the 90% isodose depth in SPS phantom is lesser than that in SP34 phantom as the number of backscattered electrons in SPS phantom at slab-kailwood interface is lesser. The depth of the isodose curves in all the three mediums goes on increasing from 80% to 40%, although the depth of the same isodose curve in all the three mediums varied significantly. The depth of each isodose curve from 80% to 50% is highest in CT image of chest, then in CT image of SPS phantom, and then in CT images of SP34 phantom. The variation in the depths of same isodose curves in the CT image of chest and that of SPS phantom is due to the slightly lesser density of the lung as compared to that of pinewood, also the varying thickness of the lung and uniform thickness of the pinewood across the field are other factors for this difference. Forty percent isodose depth in SPS phantom is higher than that in chest level of patient as the density of soft tissue behind the lung is higher in comparison to that of SP34 slabs. Most of the radiotherapy centers in developing countries use slab phantom of 30 cm×30 cm×30 cm size for patient-specific QA; for this purpose, all the beams are set to gantry angle 0° on TPS while making the QA plan, so because of the simpler medium of the phantom, i.e., similar density throughout its volume, QA results are always achieved well within the tolerance limits, i.e., <3%. In the current study, similar results have been observed, variation in the planned and measured doses at all the three points is <1%. Hence, using the phantom of same density throughout its volume for the QA of plans done on different heterogeneous body sites of patient is not rational. As the density of soft tissue is higher than that of air cavity, when beam is incident, then higher number of secondary electrons is produced in soft tissue, the number of scattering back electrons at interface region in the air cavity will be lesser, therefore lesser dose will be deposited at the interface. Since the density of air cavity is lesser than that of soft tissue, lesser number of secondary electrons is produced, and when they travel toward air cavity-soft tissue interface, the number of scattering back electrons increases at interface region. Hence, along with the improvement in the dose calculation algorithms, it is also equally important to use the heterogeneous body phantoms for patient-specific dosimetry which would mimic the actual human body. This study clearly finds that the SPS phantom is better to use for the patient-specific QA when compared to the SP34 slab phantom. It will be good if the chest phantom in the same shape as that of actual human chest is prepared using pinewood or any other material of equivalent density to form lung, polystyrene C8H8 (composition: 98% polystyrene + 2% TiO2) to form soft tissue, and suitable material to form ribs and spine. 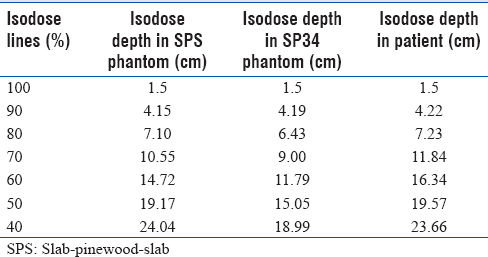 The results of this study on the density measurement and depth of isodose curves indicate that SPS phantom represents the chest level of human body in better way as compared to SP34 slab phantom. In addition, the point dose measurements at the interface regions and 5 cm depth in pinewood indicate that the use of heterogeneous phantom of the same density pattern as that of actual human body site should be done for verifying the dose calculated by the algorithm. It can be concluded that SPS phantom is a better option for patient-specific QA, however along with density patterns, the phantom in the same shape and size as that of actual human chest level will be the good phantom for more accurate dose verification. Papanikolaou N, Battista J, Mackie T, Kappas C, Boyer A. Tissue Inhomogeneity Corrections for Megavoltage Photon Beams. AAPM Report No. 85, Task Group No. 65; 2004. Gagné IM, Zavgorodni S. Evaluation of the analytical anisotropic algorithm in an extreme water-lung interface phantom using Monte Carlo dose calculations. J Appl Clin Med Phys 2006;8:33-46. Sievinen J, Ulmer W, Kaissl W. AAA photon dose calculation Model in Eclipse. Palo Alto, CA: Varian Medical Systems; 2005. Aarup LR, Nahum AE, Zacharatou C, Juhler-Nøttrup T, Knöös T, Nyström H, et al. The effect of different lung densities on the accuracy of various radiotherapy dose calculation methods: Implications for tumour coverage. Radiother Oncol 2009;91:405-14. Broerse JJ, Zoetelief J. Dose inhomogeneities for photons and neutrons near interfaces. Radiat Prot Dosimetry 2004;112:509-17. Gurjar OP, Mishra SP, Bhandari V, Pathak P, Patel P, Shrivastav G. Radiation dose verification using real tissue phantom in modern radiotherapy techniques. J Med Phys 2014;39:44-9. Christ G. White polystyrene as a substitute for water in high energy photon dosimetry. Med Phys 1995;22:2097-100. Gurjar OP, Mishra SP, Bhandari V, Pathak P, Pant S, Patel P. A study on the necessity of kV-CBCT imaging compared to kV-orthogonal portal imaging based on setup errors: Considering other socioeconomical factors. J Cancer Res Ther 2014;10:583-6. ICRU Report 83. Prescribing, Recording, and Reporting Photon-Beam Intensity-Modulated Radiation Therapy (IMRT). International Commission on Radiation Units and Measurements, Bethesda; 2010. Khan FM. The Physics of Radiation Therapy. 4th ed. Philadelphia: Lippincott Williams and Wilkins; 2010. Attix FH. Introduction to Radiological Physics and Radiation Dosimetry. Hoboken: John Wiley and Sons; 1986. Ravikumar B, Lakshminarayana S. Determination of the tissue inhomogeneity correction in high dose rate brachytherapy for iridium-192 source. J Med Phys 2012;37:27-31. Kumar A, Sharma SD, Arya AK, Gupta S, Shrotriya D. Effect of low-density heterogeneities in telecobalt therapy and validation of dose calculation algorithm of a treatment planning system. J Med Phys 2011;36:198-204. 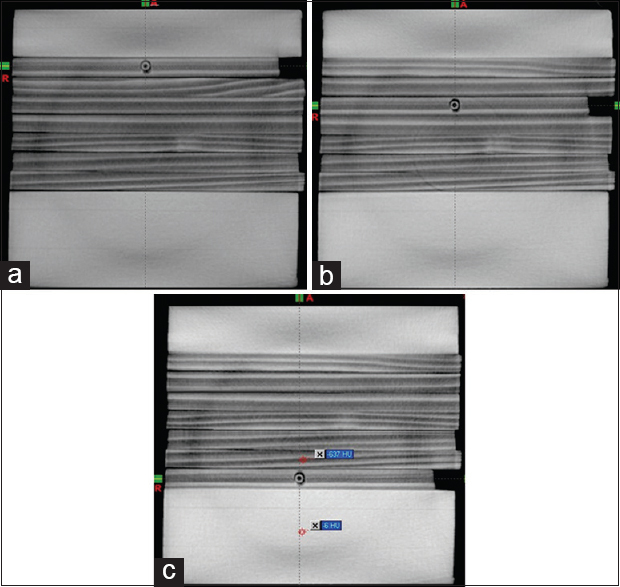 Binger T, Seifert H, Blass G, Bormann KH, Rücker M. Dose inhomogeneities on surfaces of different dental implants during irradiation with high-energy photons. Dentomaxillofac Radiol 2008;37:149-53.